[Peter Crimmins] I was talking to someone who knows about symbols in traditional fraktur, who said they don’t really stand for anything specific. They’re just decorative. But you suggested that there are things in this particular embroidery that are meaningful in particular ways. [Shelley Spector] There’s a lot of imagery in the embroidery that is used by many cultures – including my Jewish culture – to represent things that people hope for, or think about, or want for the world or themselves. Things like trees, birds, flowers. I saw symbols of hope. That tapestry is important not just what it is, but how it came to be. Frances Lichten designed it, her mother sewed it, and Katherine Milhous donated it to Philadelphia Museum of Art. You were fascinated by Lichten and Milhous. The story of Katherine Milhouse and Frances Lichten started as a mystery to me. There was no mention of why they were paired together. If you Google Lichten, Milhous comes up, but it doesn’t say why. Only through research of the archives at Philadelphia Public Library that I learned they lived and worked together for 40 years on Pine Street, went to school together in Philadelphia, had lives that looked very much like they were a couple. So I took that leap, and decided they were. You worked with that for the show. The facts you uncovered and the assumptions you made created the narrative that informed your show. I made up the story I believed to be true. Is that why you asked your mother to help you with some of the pieces? At bottom of the Lichten piece, it says who made the piece, where it was made, the year it was made, and that she made it with her mother, who was 82. My other mother was 82 at the time. I thought, oh, wow why don’t I ask my mother to join me in making a piece? You mentioned that while your mother is very handy, she’s, um, maybe a little baffled by your art? Maybe ‘baffled’ is a little strong. There’s a difference between making things, and making what people think of as fine art. One is about the making of it, and craft and materials and mastering them; the other includes ideas behind it and has themes and deeper meanings. I incorporate both. She can relate to the making end of it, and she can understand the meaning when I explain it to her, but her comfort zone is in the making of it. Your process of making art is really labor-intensive, it takes a long time with repetitive tasks. Does the time and repetition help you think through what you’re doing? My work is super labor-intensive. I don’t like to think about how labor-intensive it is. I’ve been making art for decades, and I always thought I would get to a point where I would make stuff faster. It never happened. If I did make something faster, the contextual ideas and the meaning behind it – I wouldn’t know it yet. It takes the same amount of time for me to make something as to figure out what it is I’m making, and why. 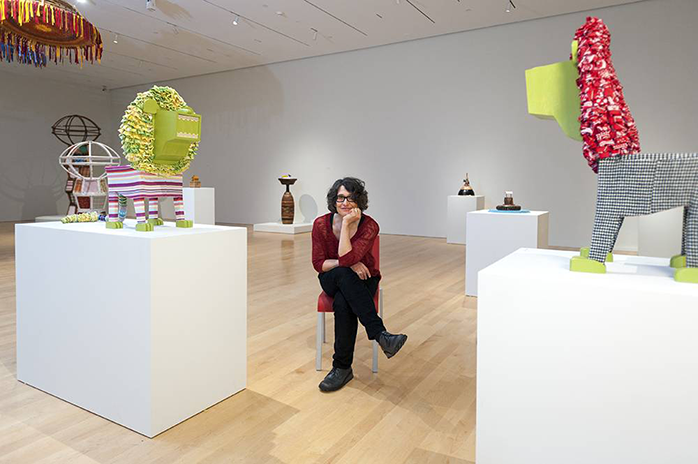 The Philadelphia Museum of Art asked Shelley Spector to search its archives for an object on which to base her show, “Keep the Home Fires Burning” (now on view). She found a tapestry by Frances Lichten, a mid-20th century scholar of a Pennsylvania Dutch style of folk art, fraktur. Lichten designed a tapestry in the fraktur style and asked her mother to embroider it. Spector used that tapestry as a foundation for a series of soft sculptures derived from textiles and found objects. She was inspired by Lichten’s embrace of domestic craft and cultural appropriation. Mostly, she was fascinated by Lichten and Milhous. Katherine Milhous was a painter and illustrator known for her Caldecott Award-winning book, “The Egg Tree.” She and Lichten met at the Philadelphia Museum School of Industrial Art (now University of the Arts). They were inseparable for the rest of their lives. Shelley Spector asked her mother to create a pair of small children’s chairs re-upholstered to resemble lions. The soft, whimsical “Lions of Judah” symbolize the protectors of the ancient Jewish tribe. “The craftsmen who long ago employed the attractive motifs may not have drawn or painted with professional skill, but they used form with such directness that we can do little to improve them.” – from “Folk Art Motifs of Pennsylvania,” Frances Lichten. In 1961, Lichten died of Amyotrophic Lateral Sclerosis (ALS, aka Lou Gehrig’s disease). During her decline, Lichten gave power of attorney to Milhous. Lichten’s pre-death arrangements were made through Philadelphia attorney John Bernheimer. Several months before her death, she gave Bernheimer a hand-drawn copy of a book plate used by his late father. – letter from John Bernheimer to Katherine Milhous, October 3, 1960. Peter Crimmins is an arts and culture reporter with WHYY-FM in Philadelphia, Philly’s NPR station. He is originally from California (San Diego, then San Francisco Bay Area) who has been working his entire professional career (and then some) in radio. He has created audio guides for art installation projects (Kay Healy’s installation at the Central Branch of the Free Library is still on view), and used to record+edit artist interview podcasts for TheArtBlog.org.